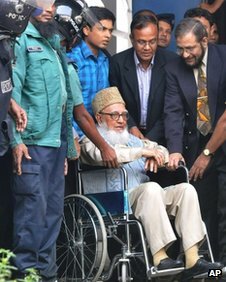 Prof Ghulam Azam was arrested on 11th Jan 2012. At the age of 91, on June 11th he completed 17 months (517 days) in that lonely prison cell for crimes he is innocent of. During these 17 months Prof Azam has been inflicted with health complications due to old age, including high blood pressure and losing consciousness several times. Nonetheless he has been denied bail and adequate medical care. Prof Azam has been unjustly imprisoned as a political prisoner a number of times since his active involvement in politics. This is the 5th time in his life that he is in jail and it is the longest duration of imprisonment he has ever endured. 16 months was his previous highest when he was last arrested in March 1992 in which he came out victorious with his right of citizenship. Prayers are sought for justice, dignity and health for Prof Azam. By sdcuk in Uncategorized on June 17, 2013 . As we know with evidence, Mr. Golam Azam is a great politician and he didn’t do anything anti-state activities. Present Bangladesh Govt. accused him falsely for getting political benefit. If ensure justice, then Mr. Golam Azam must be free.